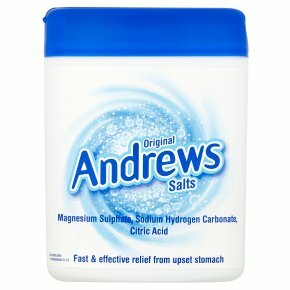 How to use Original Andrews Salts. See inside label for how to open and dosage instructions. Check before you take this medicine if you need a laxative dose every day or you have persistent abdominal pain (tummy ache). How to take Original Andrews Salts How to open: Lift end of lid. Check inner seal is intact before first use . Break inner seal carefully. How to take: Adults: For upset stomach, indigestion and over-indulgence, measure one level spoonful (5 ml spoonful) into a glass of water and drink. Take as needed, up to a maximum of 4 times a day. For constipation. Measure two level spoonfuls (two 5 ml spoonfuls) into a glass of water and drink. Take before breakfast or at bedtime. Use within3 months of opening. Check inner seal is intact before first use. Children over 3 year: Use half the adult dose.<br>Not suitable for children under 3 years.<br><br>If you take too much you may get diarrhoea. If this happens, reduce the dose and the effect should go away.<br><br>Check before you take Original Andrews Salts:<br>Ask your doctor or pharmacist:<br>If you are taking any prescribed medicines, particularly tetracycline antibiotics (e.g. minocycline)<br>If you are pregnant<br>If you are on a controlled sodium diet. Each 5 ml spoonful contains 319 mg of sodium<br>If you have high blood pressure, heart or kidney disease and avoid frequent use.<br><br>Tell your doctor or pharmacist:<br>If you need a laxative dose every day or you have persistent abdominal pain (tummy ache)<br>If symptoms persist<br>If you experience any unwanted effects.<br><br>Keep out of the reach and sight of children.